Purchase online LM3915 Dot/Bar Display Driver in India at low price from DNA Technology, Nashik. 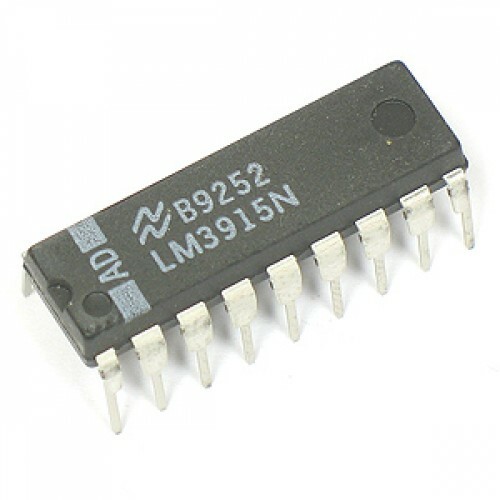 The LM3915 is a monolithic integrated circuit that senses analog voltage levels and drives ten LEDs, LCDs or vacuum fluorescent displays, providing a ogarithmic 3 dB/step analog display. One pin changes the display from a bar graph to a moving dot programmable, eliminating the need for current limiting resistors. The whole display system can operate from a single supply as low as 3V or as high as 25V. The IC contains an adjustable voltage reference and an accurate ten-step voltage divider. The high-impedance input buffer accepts signals down to ground and up to within 1.5V of the positive supply. Further, it needs no protection against inputs of ±35V. The input buffer drives 10 individual comparators referenced to the precision divider. Accuracy is typically better than 1 dB. The LM3915 is extremely easy to apply. A 1.2V fullscale meter requires only one resistor in addition to the ten LEDs. One more resistor programs the fullscale anywhere from 1.2V to 12V independent of supply voltage. LED brightness is easily controlled with a single pot. The LM3915 is very versatile. The outputs can drive LCDs, vacuum fluorescents and incandescent bulbs as well as LEDs of any color. Multiple devices can be cascaded for a dot or bar mode display with a range of 60 or 90 dB. LM3915s can also be cascaded with LM3914s for a linear/log display or with LM3916s for an extended-range VU meter.